The issue we're tackling today might overwhelm you because of what it means for your business. But there's a simple, helpful solution -- have us handle all of it for you. Please reach out if you find out the IRS is auditing your business. We'd love to help in any way. 1. The most important item is that any third-party income and reports agree with your records. This is why it's crucial to maintain all such expenses throughout the year. 2. Fill out all the correct forms. 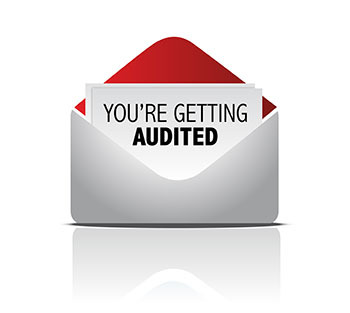 Is the audit you're going through a correspondence audit? Office audit? Field Audit? Each type of audit will dictate which forms you need to fill out. 4. Is your business bank account free of irregularities? Good. The random, large expenses will only hurt you in the long run and give the IRS something to call into question if it doesn't line up with your business' trend lines. If you do have those outliers, it's important you prove the necessary documentation to back those purchases. Side Note: it's imperative you keep business and personal accounts separate throughout the duration of the audit. 5. Measure twice, cut once. It's vital to double- and triple-check your information when filling out necessary audit forms. Get a second (and maybe third) pair of eyes from someone else on your leadership team when fulfilling each mathematical response. FOR INSTANCE, balancing your total deductions with your income is important. Extensive deductions adding up to a significant portion of your income will sound audit alarms for the IRS. Get those numbers right with attention to detail. Our goal is to prevent any "audit fear" in the first place. How do we do that? We help you year-round so that come tax season, your needs are handled by a pro. Doesn't that sound better than fearing the process? If you think so, then give us a call so we can help your business before you have to go it alone. There is strength in numbers ... that's why we have your back. BE THE ROAR not the echo!